Everyone knows that Sonny would never go on a cruise. What this episode presupposes, is that he would. !!!!!!!!! !WARNING: MURDER ON THE ORIENT EXPRESS SPOILERS AHEAD!!!!!!!!!!!! Happy Thanksgiving, dear viewers readers. Let me tell you about some things I’m grateful for. I’ll start with the Weekly Substandard podcast which has allowed me to avoid the depressing front page news 2017 has offered us. Yes, it seems like literally everyone in Hollywood and politics is a sexual predator. Kyrie Eleison. Which reminds me of something else I’m thankful for. I’m thankful for the living God who sent his son Jesus to save us from our sins. Not just on on judgment day, but today. He’s our only hope. And I’m also grateful for my family which is a gift from God. They are far more wonderful than I deserve. And I’ll celebrate my gratitude for receiving all these wonders which I don’t deserve by gorging myself with turkey and mashed potatoes and watching football on Thursday. This week’s episode opens in the middle of last week’s podcast. They are discussing the recent “Kenneth Branagh Joint,” Murder on the Orient Express. It’s a movie based on the 1934 Agatha Christie novel of the same name in which the inimitable Hercule Poirot solves a mystery on a train by making the conclusion that EVERYONE ON THE TRAIN IS THE MURDERER. Yes, this lazy detective “solves” his crimes by accusing everyone visible at the end of the episode of being in on it. Except him. He’s like the opposite Oprah. Instead of saying, “You get a car! You get a car!” and giving away a car to everyone in the audience, Poirot accuses everyone of murder. It doesn’t get much lazier than this. Yeah, there’s no “Just one more thing.” It’s, “I can’t solve this case so I’ll accuse everyone involved of being a cold-blooded murderer. And then these dang Millennials just want to live in their parents’ basement and eat avocado toast. * Sorry, I lost my train of thought. *This week’s intro brought to you by Andy Rooney. You know, we’ve gotten off topic here. Let’s jump right in. Sonny: Why would anyone want to ride the Orient express? It’s more than twice the price of a flight and takes ten times as long. JVL: It’s like a cruise on rails and it’s awesome. Sonny: That sounds terrible. There’s literally nothing I, actually, I have just found something that would be worse than going on a cruise. JVL: I would pay money to shadow you around a cruise ship. Sonny: Oh, it’s the worst. Oh, I would never go on a cruise ship. Never. You couldn’t get me on a cruise ship. Vic: He’d just hang out at the bar. JVL: But people would come up and talk to him. Sonny: You know how you can get me on a cruise ship? 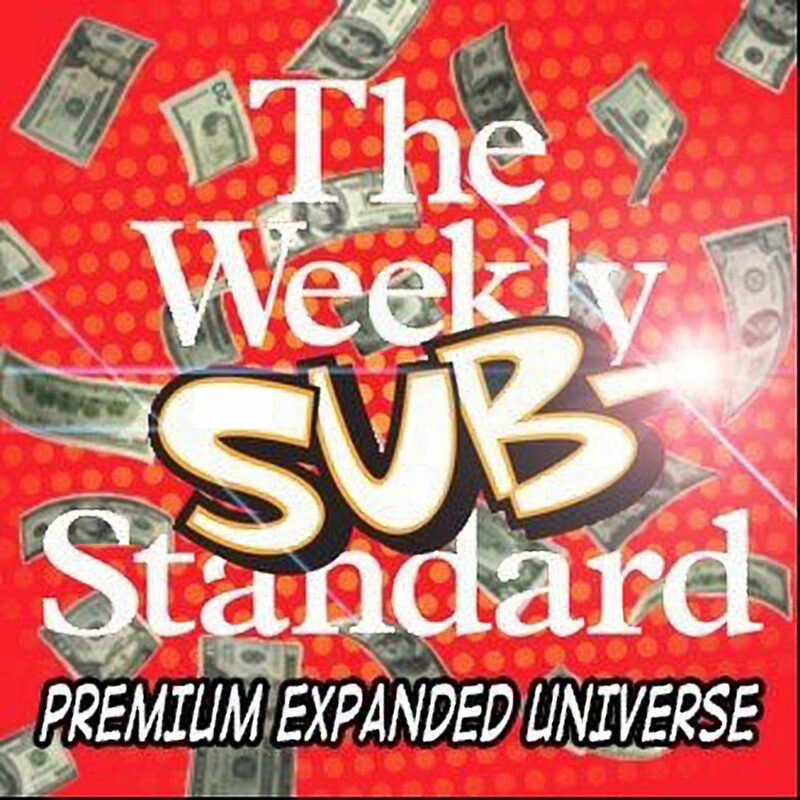 If the Weekly Standard would pay me money to do a live Weekly Substandard show. But it would have to be a lot of money. Because I couldn’t imagine actually being on a ship for an extended period of time. We have airplanes for a reason. We should sink all the ships to the bottom of ocean. No, you won’t see me on a cruise ship any time soon. Vic is all in on the cruise, and despite the fact that it is an Alaskan cruise, he has packed a wardrobe of Hawaiian shirts and cargo shorts. No, not prAna cargo shorts. And this irks JVL. Actually, to say it irks him is a massive understatement. In fact, JVL shelled out some serious cash to buy his friend some prAna cargo shorts for this trip, and Vic told him, “The St. John’s Bay shorts are just more comfortable.” JVL has not hidden his ire over Vic’s decision. Sonny is exquisitely layered, as always. JVL is wearing some obscure, expensive brand of clothing that requires his wife to shop exclusively at thrift stores for herself and her children. This scene opens on the dock as they are boarding the ship, not because it’s realistic, but because it works well for the narrative. There would actually be a massive amount of security to pass through and ridiculously long lines, but for the sake of the narrative these three are just strolling on board. JVL (snorts, still sore from Vic’s obvious disdain of his gift to him) I wish I could say the same. Vic: Sonny, I never thought I’d see you here. Sonny: Well, Bill Kristol took me out for margaritas at Chili’s and I woke up the next day with a nasty hangover and the bad news that I signed a contract to go on this (bleeping) trip. Vic: Did I hear Jonah Goldberg is coming on this cruise? JVL: No, he finally “came out of the closet,” so to speak, and took a few new jobs. One at the Southern Poverty Law Center, and another as a contributing editor at The Nation. He’s also writing for I Hate Dogs magazine. Vic: Weird, I thought he was the genuine article this whole time. Sonny: What have I been trying to tell you? People are garbage. JVL: On the plus side, Ben Sasse is now a huge fan of our podcast. He’s actually here on the cruise. JVL: (screams with rage) My Apple Watch Nike+ is telling me I should get some exercise. (hold his wrist to his mouth and spits out the next sentence with venom) I’ve been sitting in an airplane all day! Ridiculous! And I still have to watch movies on my giant phone screen. Vic: Where are you going? JVL: There will be people there. Sonny: Well, then to the duty-free store and then to my room to drink. Vic: (being the consummate professional he is) Don’t forget the live taping of the Substandard at 7:00. Vic: (turning to JVL) Well, I think I’m headed to the buffet. I want to see if there is a section of Chinese food. JVL: The buffet? That trough of norovirus and sadness? Vic: What did you plan on eating? JVL: Oh, I took a page out of Sonny’s playbook and packed MRE’s and bottled water for this trip. Vic: Well, want to head to the pool afterwards? JVL: Again, no. Norovirus and sadness. I’m going to focus on running on the treadmill at the gym and watching movies on my phone in portrait mode. Besides that I’ll talk at the three required panels, record an episode, and work my usual 19 hours a day. JVL: At least I don’t have to watch my children. Vic: Oh, look, there’s an ice cream cone stand! Let’s get a cone. JVL, ice cream will cheer you up. JVL: (with undisguised contempt) An ice cream cone? Vic, I’m going to my room. I’m going to need some space. Maria, you have my bags? The camera pans out to show Vic and JVL’s interns, Sandy and Maria. Remember, Sandy is Vic’s intern. She is a journalism major at Georgetown, but this isn’t the only reason JVL hates her. Maria is JVL’s intern and also his greatest fan. Maria is weighed down with hundreds of pounds of JVL’s luggage, all packed in sponsor Away Travel® luggage. Sandy has a legal pad out and a tape recorder ready in case she needs to cover any breaking news. Maria: Yes, Mr. Last. I’m right behind you. To be continued. Check back on Black Friday for the conclusion of this episode.